A major topic of conversation surrounding Paul Thomas Anderson’s The Master had nothing to do with the enthralling performances of Joaquin Phoenix and Philip Seymour Hoffman, or even with the film’s obvious connections to Scientology. Film savvy audiences spoke about the need to see The Master in 70mm, Anderson’s preferred method of visual presentation. But what, exactly, is 70mm presentation? How is this different than, say, IMAX (which several “event” movies like Mission Impossible: Ghost Protocol or the re-released Raiders of the Lost Ark prefer)? And where do you have to actually go to see Anderson’s opus in 70mm? I was lucky enough to see Anderson’s film at the Toronto International Film Festival, where the movie screened in 70mm at the festival’s TIFF Bell Lightbox. I sat next to my good friend Jay Morong, a lecturer of Theater and Film at the University of North Carolina at Charlotte who also has served as film programmer for the Charlotte Film Society and has been a film projectionist in Massachusetts and North Carolina for 16 years. After our Master screening, I picked Morong’s brain on the beauty of PTA’s vision, and the importance of 70mm projection. You can read what he had to say below, and if you still have questions, feel free to post them in the comments-- I'll do my best to answer them or go back to expert Jay for even more info. OK, Jay, what, exactly, does 70mm mean? 70mm -- and we are talking 5 perforation 70mm, not IMAX 15 perforation 70mm -- is a large format film stock which produces a motion picture format that is twice the width of a standard 35mm film image. [Editor's note: Perforations are the holes placed along the sides of each frame, which can be used to measure the height of a frame. The highest number right now is 15, which signifies an IMAX-ready frame. PTA's The Master, even in 70mm, is 5 perforations, and is not being screened in IMAX.] This creates an image area that is at least 3 times the size of standard 35mm. This means that the contrast, colors, and sharpness of the image are impeccable, and when projected on bigger screens there is little-to-no loss of picture quality. It is (apart from true 70mm/15perf IMAX) the best image that can be presented on a motion picture screen. So that means 70mm is the best possible film medium for a filmmaker to use to get the clearest, cleanest, most vibrant image possible as an artist. Cool. But is 70mm available in every major market? And if it isn't available at a local theater, why not? That depends what you mean by “major market.” The short answer is “No.” Most markets that I would consider “major markets” (New York, Chicago, Boston, Los Angeles, San Francisco) all have 70mm, and some of these cities have multiple 70mm houses. (Boston, for example, has the Somerville Theater and the Coolidge Corner Cinema that can both show 70mm.) These cities are, of course, A Tier exhibition markets, so they never lost 70mm and still have it. For the B and C markets, 70mm has been gone for a while. In fact, I believe the only 70mm in the entire state of North Carolina is housed at the North Carolina School for the Arts. So while 70mm still exists in most states, there are probably no more than 100 theaters (if that) in the country capable of presenting a film in 70mm. The reason why this happened? Who knows, but my theory has to do with the shift of major theater chains from changeover booths -- where a union/experienced projectionist had to be present to change reels every 20 minutes or so -- to platter systems, where you build up the entire print on a platter and then press start once on a projector and the entire movie plays all the way through. Basically, the theater chains in the 1970s, and onwards, realized that with platter systems you could basically train anyone to run a show. Projection became less of a specialized skill for the chains. This in turn would help them get rid of union projectionists (a skilled labor job) and save them money, since the managers of the theaters could now do projection. This also started the trend of substandard projection (out of focus, poor framing, dim bulbs, damaged prints) in theaters. It also meant you could build theaters with more screens (multiplexes) since there was less attention needed to run a film. You cannot run a 70mm print on a platter, so as more and more theaters switched to manager-operated projection booths, there was no skilled labor to run 70mm. Eventually, over time, I think filmmakers and studios saw that this format wasn’t viable since their prints couldn’t be screened in houses, and they slowly abandoned the format. This of course didn’t happen overnight. It took decades. So you still had 70mm in the ‘80s and ‘90s, but it slowly fizzled away as a viable film format for filmmakers. 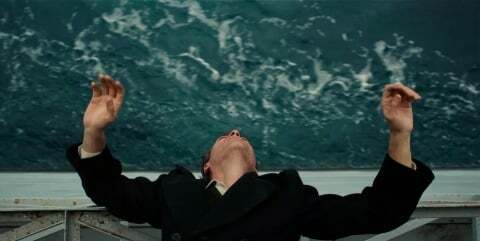 When you watched The Master in 70mm, did you see a difference? What looked different? And how will it differ from a digital projection, if audiences can’t see it in 70mm as PTA wishes? Let’s be honest: I sure like to think I did. Although some of it may be subconscious, since I love film formats so much. But that print looked amazing! The print was incredibly sharp, the colors were incredible, and the contrast between the lights and the darks was stunning! I think that is the key to the difference between digital projection and film projection. Digital, for me, can never get the contrast exactly right. It is always a little muddied or grayed out. So you never get that real depth of field and those real good edges. Things just don’t pop in digital (especially if they were shot originally on film and then transferred to a digital format) like they do with a film print … and especially a 70mm film. If something is shot on film and then converted to digital, digital just cannot get the look of film correct. It can get close, but digital still cannot reproduce a film image exactly. Digital just cannot get the brightness correct in my opinion. The bottom line for the screening of The Master is this: Watching a film shot in 70mm and then projected in 70mm by an experienced film projectionist means you are not going to get a better image than that, ever, in a cinema (except true 70mm/15perf IMAX). It is the best image there is. That is the highest resolution we have. You cannot get that at home, and digital cinema cannot replicate it. So while 2K or even 4K digital projection is what most people will see the film in -- and it will look great -- you are still miles away from the true celluloid image being presented at some theaters for this film. Click here for an up-to-date list of theaters capable of screening The Master in 70mm.